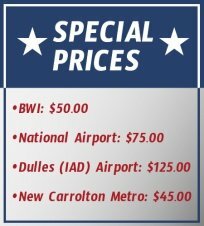 Whether you need a cab to take you to BWI airport, or would like to be received and taken to your destination, our BWI taxi service offer the best experience, and now at a special $50 rate. Our drivers are always on time, and we guarantee that you’ll be fully satisfied with your ride and their attention. A Convenient Solution for Travelers and Visitors! Leaving your car at the airport is synonymous with parking fees and theft risk. And if you’re a visitor, renting a car may result too expensive and unnecessary. When you request one of our cabs, you can avoid all the hassle. Traveling from, or to BWI has never been as easy as it is with Annapolis Taxi Service! We will always have the right cab for you, no matter how much luggage you carry. Traveling can sometimes be very stressful, and our goal is to make it as simple possible for our customers. Also, all of our drivers are very friendly and will be more than happy to help you with anything you need. You can book a ride with us at any time, day or night. We know that emergency travel can be very common, and we give our customers the benefit of having an always-available taxi service for BWI airport shuttle. If you need an airport shuttle to BWI, or from BWI to Annapolis, don’t hesitate to contact us now!